As part of our service to the bereaved, All Saints provides, at a modest cost, a lunch following funerals. These meals are made possible by our Funeral Dinner Ministry, which is made up of many parishioners serving as Team Leaders, Team Callers, Workers, Food Donors, and Clean Up Crew. 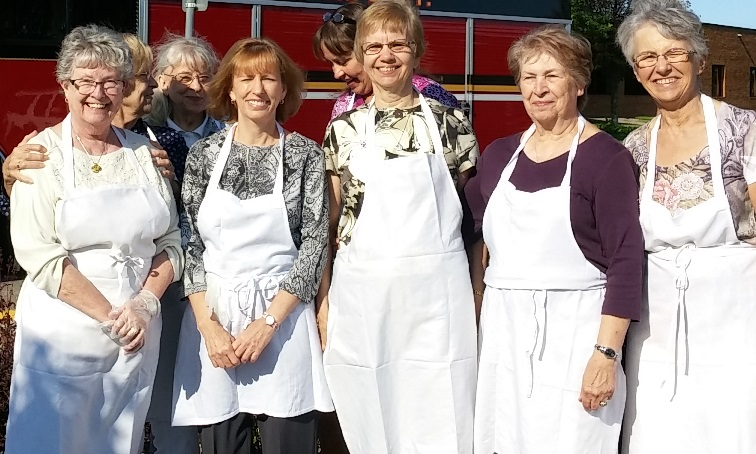 Many, many parishioners are the helping hands behind serving meals to the bereaved and their families at a time when even the simplest meal is so very welcomed. All Saints is very grateful to those serving in this ministry. When a funeral is scheduled, callers go to the roster and contact Workers, Food Donors, and Clean Up Crew. Notice is usually short, but the work is very manageable. Those who have benefited from this have spoken of how nice it is to be able to gather with loved ones at the time of a loss. This is truly a ministry of compassion and healing. There are three teams that take turns serving at funeral lunches / dinners. We have 3-4 funerals a month on average, and most of them include a meal. Typically, a meal will run from about 12:00 pm until 1:30 pm. Set ups can begin as early as 8:30 am and clean ups can take anywhere from 1-2 hours.